Spring and Autumn are the best time to visit Bhutan. Having said so, summer and winter have their own draws and attractions. 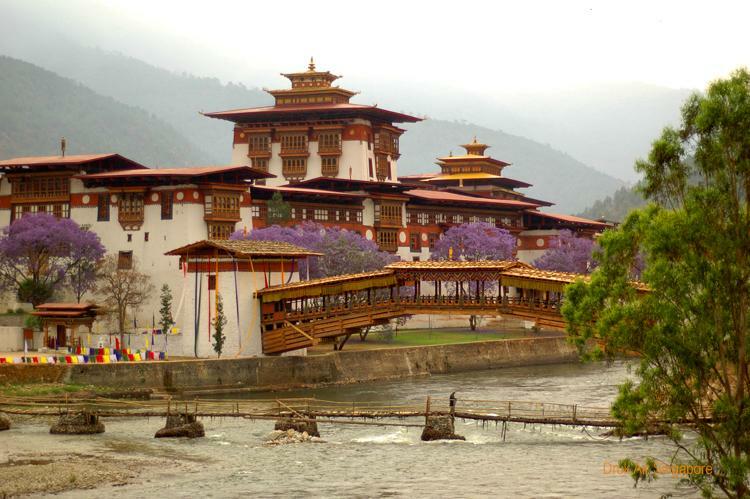 Spring is the favourite time to visit Bhutan. Nature lovers who are keen on local flora should consider visiting Bhutan end of April or in May. Flowers would be in full bloom then. The Paro Tshechu usually takes place in early April. This is the best chance to meet the King of Bhutan as he often makes his way to the festivities between the 3rd and last day. The ever-popular 5-day Paro Tshechu also means that Paro will be teeming with travellers. Hotels & services may be overwhelmed as the better hotels and guides would have been pre-booked. Drukair tickets would be fully sold out by January. 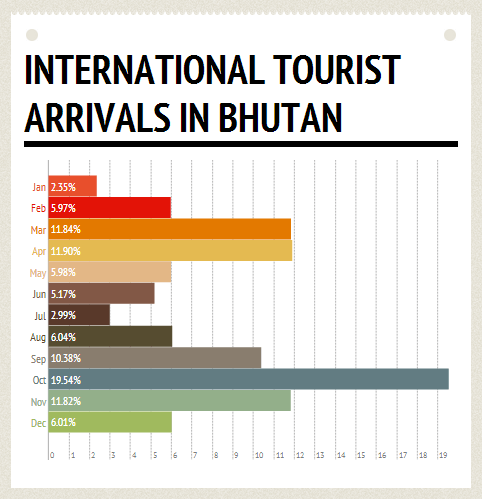 Fall is another high and crowded season for Bhutan. Though Bhutan does not offer browning forest nor Maples, the mild weather in autumn makes it a perfect time to visit Bhutan. Thimphu Festival usually takes places at the end of September or early October. Black-Necked Crane Festival - Stay with a local villager in the beautiful valley of Phobjikha and witness the one day Black-Necked Crane Festival and do your part to help nature conservation! October - see the valleys turn into a shade of gold as rice farmers prepare to harvest their rice crops. Another crowded festival calendar, this time in central Bhutan is the Jakar, Jambay Lhakhang Drup & Prakar Tshechu. Trongsa of travellers pays homage to the Switzerland of Asia at this time to attend the mysterious Jambay festivities that was fabled for its bonfire dance of 20 masked and naked dancers. If you would like to attend this festival, do be prepared to stay in some less comfortable hotels too. If you like to avoid the higher tariff and the cold of winter, consider visiting Bhutan early June. If the monsoon is late, the whole of June will be great for traveling. Monsoon will be in its earnest in July. Having said so, our personal experience with monsoon in Bhutan has been limited to afternoon light shower once every 2 to 3 days. Some outlying district such as Gangtey can be given a miss as the country road can be swollen with mud. 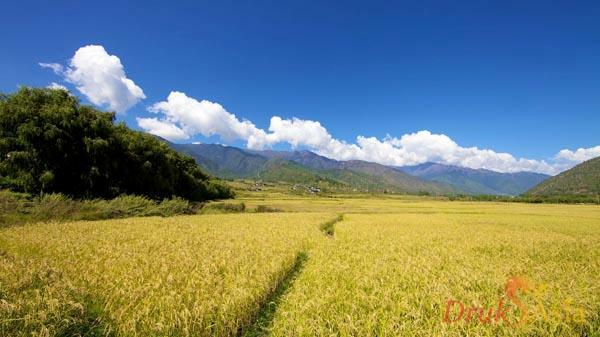 Summer often offers vibrant green foresting and flourishing paddy fields against a backdrop of the clear blue sky after the rain. Kurjey Tshechu in late June celebrates a very important holy sites of Guru Rinpoche. The summer season sees a lower level of tourists as many have the misconception that Bhutan may experience a rainy deluge similar to many parts of South Asia. This is not true. Though it dubbed the monsoon, Bhutan experiences relatively light rain with most rainfall confined to the late afternoon and does not affect most travellers’ itinerary. To avoid the crowd and catch the Black-Necked Cranes, winter would be the time to go. To catch Himalayan blue sky without paying the additional tariff, consider visiting Bhutan in December. The temperature will not be too cold yet as lowest temperature usually takes places near the end of January. 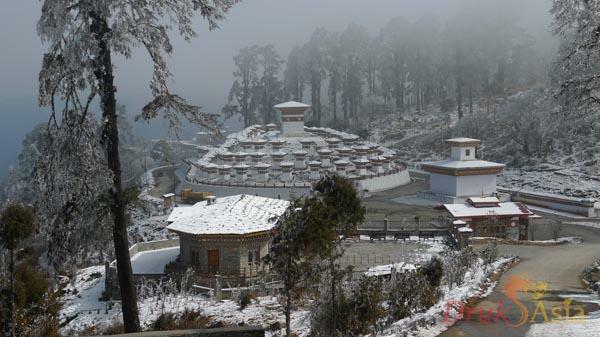 In January or February, Paro and Thimphu may experience a one-day snow. 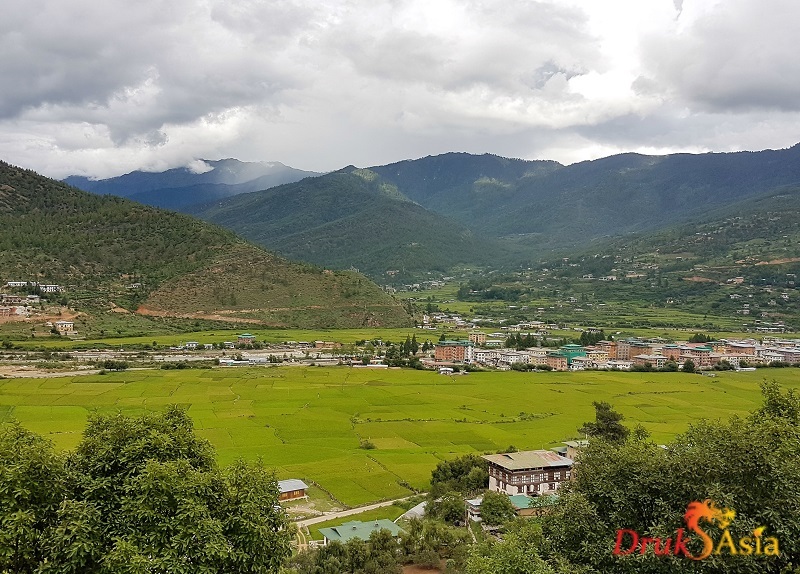 Punakha Dromche & Tshechu in February - The Punakha Dromche & Tshechu is a week-long celebration of the founding of Bhutan in the 1600s. The festivities take place around the ancient capital and most beautiful dzong in Bhutan. The mild weather of lower Punakha also makes this town a great winter escape for the Bhutanese. Trongsa Tshechu - The Trongsa Tshechu takes place in the Trongsa Dzong, is an intimate affair with only a small handful of attending travellers. This festival has some of the most elaborate festival costume for the dancing lamas. Expect snowfall in mid-Jan till early Feb. Extreme weather and heavy snowfall may render the roads to central & eastern Bhutan un-passable. About 20 percent of international tourists arrive in the month of October. We would highly recommend travelers to book at least three months in advance if you are considering of traveling in the month of October. Travelers who would like to avoid the crowd but enjoy the best weather may want to consider the month of May and November. If you would like to save as much as possible with the lowest possible price, consider traveling in June or December. You would enjoy the low season price while still having favourable weather.